What a year this has been! It has been one huge emotional roller coaster, and we are so thankful for the miracle of Jeremy's bone marrow transplant. It is truly amazing how such a small amount of blood (donated umbilical cord blood, which was about 100mls including all the preservation chemicals) was able to engraft and grow into bone marrow throughout the whole of Jeremy's body. We also have memories of a synthetic/metallic creamed corn smell from those chemicals. It is awesome because there were so many factors and issues where the doctors and nurses simply did not know what was happening, but God's mighty hand worked through them to help our little boy. There is a long journey ahead, but we are sustained and encouraged so far. We were also saddened to hear of close friends who were also diagnosed with cancer, and full of joy that some are now in remission. We have been strengthened by the constant prayers of our friends and also of those who we do not know, yet who have been faithfully praying for Jeremy and our family. And we know that we need to live one day at a time, being thankful for our blessings, enjoying each moment with our children, trusting in our good God, and looking forward to a time where there will be no more sickness or sadness or pain. Jeremy had a busy morning teaching KonKon and PawPaw how to play Supermario Bros. He drank several glasses of strawberry soy milk today, but his food intake was minimal - soy icecream for breakfast, 1/2 piece of bread with ham for lunch, and a few mouthfuls of udon and pork mince for dinner. Last night we ran water instead of nasogastric feeds through Jeremy's tube, but it did not seem to have that much impact on his appetite today. He made a big show of saying "delicious chicken sausages" and "thank you BaBa for cooking them", but then ate less than 2 little sausages for lunch. The only things that he was interested in eating at dinnertime were fresh lychees! Boxing Day - 2 hours delayed! It was a strange day, where everything was running about 2 hours late. Breakfast was late, lunch was later, dinner and bedtime were also running behind schedule. It was totally bizzare, but probably a consequence of a busy Christmas day and night. We might not get to go outside, but our hands are full trying to keep our little ones amused. We praise God that we are able to wish you a happy Christmas from the 4 of us! Thank you for your faithful prayers for Jeremy and our family - our God is a great God and He has been so merciful to us! May you and your family have a joyful Christmas remembering how God has shown mercy to all people - through the most important gift of all, His Son Jesus Christ! Thankfully it was another fine morning, so Stephanie and Jeremy could have a play at Just-A-Ship Park! They took turns driving to the North Pole and Rainbow Road. This evening, they were excited to go for a walk to meet BaBa on his way home from the train station. And now two little children, who have been eagerly awaiting tomorrow morning, are fast asleep! Stephanie and Jeremy had an early morning play at the school playground - these days the sun is hot by 9am, so we are trying to go out earlier and earlier. After a refreshing iceblock (or two! ), they decided to move all the beanbags, blankets and cushions into Jeremy's bedroom so they could have a pretend picnic. Then they did some baking for EeEe's lunch - pastries, cinnamon swirls and banana slice. Despite the active participation in the cooking, Jeremy decided that he was only interested in eating white bread with ham (without the crusts) - today he ate it for breakfast, lunch and dinner! Last night we ran water instead of his nasogastric feeds through his tube, to see if this would increase Jeremy's appetite during the day. When he woke up in the morning, he said he was hungry - usually he has no interest at all in eating breakfast! During the day, he also often told us that he was hungry - but when we put food in front of him, he still did not eat all that much. However, at dinnertime he gobbled up lots of pork ("Hurry up and cut it for me, Mummy! Only the white bits, Mummy!"). The dietician suggested that we stop his nasogastric feeds for 2 nights this week, and then see if his appetite picks up and if his weight remains stable. We will give him his nasogastric feeds tonight, and then try water again in a few nights' time. However, because we put plain water down his tube, it basically went straight through him (whereas the nasogastric feeds have to be processed in his stomach for a while) - this meant that we were more sleep-deprived today than usual, because Jeremy needed to use the bottle more often! It was a very excited little boy who helped BaBa wash the car this morning. Jeremy loves to push the soapy sponge around the car body, and today he was allowed to hold the hose and rinse off the suds (getting us wet in the process!). He often asks us when he can help wash the car, and we were glad that it was a fine morning so that he could do so! Thank God that Stephanie has recovered from her virus - her barking cough has transformed into an ordinary cough - so we decided to bring her home this afternoon. It was good for us all to be able to eat dinner together again. Today we managed to interest Jeremy in some "crunchy" (pork crackling). The funny thing was that he turned his nose up at bacon, complaining that it was "too salty", but the crackling was even more salty and he ate that without complaining. Today was the last day of the school year for Stephanie. She woke up with a bit of a barking cough and a sore throat, but no temperature. DrKonKon kindly came by to check on the little princess in the afternoon, who was then "banished" to PawPaw KonKon's place. She was very happy to be there, as there is plenty of television for her to watch. We are very thankful that PawPaw and KonKon are willing and able to take Stephanie at such short notice. Thankfully, Jeremy seems to have avoided catching the worst of it - he only has a slight cough, and has not had a sore throat. The doctors are still happy with his progress, and they took blood for his immune function test today (The results will not be known for at least another week). As Jeremy still does not feel like eating, we consulted with the dietician. We have been reassured that this is not abnormal for oncology kids, and gave us some suggestions/advice. Today's intake was more of the same - ice blocks and strawberry flavoured soy milk! Jeremy declined to partake of any nutritious foods, preferring to spend his energy eating ice blocks again. However, we did manage to interest him in drinking soy milk today when we grabbed his attention with some strawberry flavoured drink powder. They both drank 2 glasses of soy milk in double quick time! He was a bit warmer than usual today, but he was still very happy and keen on doing his online farming and fishing, as well as ordering people to play wii with him. Jeremy's nasogastric tube was almost ripped out of his nose when he was play wrestling with us, but he was very good about it and calmly drank a glass of water while we pushed it back into his nostril. Thankfully, when we tested it with litmus paper, we found that the end of his tube is back in his stomach where it should be! We are still waiting patiently for Jeremy's appetite to return. He does occasionally eat some small portions of fruit. Today he had a craving for ice blocks and ate nearly 6 of them, so at least there was some sugar, water and colouring going into him. We had another early morning pilgrimage to Big Swing Park - unfortunately, one of the big swings was broken, so they had to take turns. It was interesting to see the park slowly fill up with some adults seeking a place to lie in the sun, read a book, or just sleep on a park bench. Eventually an overworked grandmother came with a horde of children, so it was time to go home. Jeremy's hair has been slowly growing longer, at the moment it is nice and soft. When we told Jeremy that his hair is growing back and that he will need a haircut soon, he said NO! His eyebrows have also grown back thicker, but the doctor said that they should thin back to "normal" now that he has stopped his anti-rejection drugs. His eyelashes are much thicker and longer than before his transplant! (Though that will also thin out with eyebrows). 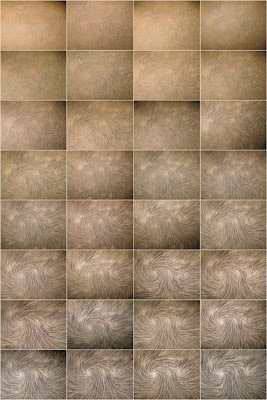 Here's a picture of the gradual hair growth over a month. Jeremy went to hospital clinic for a checkup today. His blood counts are stable, and the doctor is amazed at how well Jeremy looks. The doctor reminded us that the average length of hospital admission for an unrelated cord blood transplant is 12 weeks - praise God that Jeremy is recovering so quickly! Jeremy was keen to get involved in making meatballs for dinner - his job was first to select, then to shake herbs and spices into a bowl, which he did very enthusiastically. However, once again, when he was served the finished product, he could only manage a tiny nibble. Ken and I are still sleep-deprived - sometimes it feels like we have a newborn baby again! 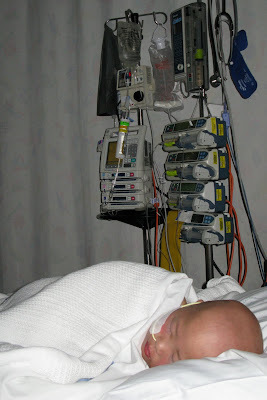 Jeremy's nasogastric feeds are running overnight, so his body is processing nearly a litre of fluids while he is asleep. As he is connected to his Kangaroo Pump, he is unable to take himself to the toilet at nights. Although he wears a nappy at nighttime, he doesn't want to wet his nappy and calls out to Mummy - who comes running with a bottle so that he can relieve himself. This happens at least 3 times every night! Jeremy is starting to learn how to ride a bike - indoors! He gets all dressed up in knee pads, elbow pads and bike helmet, then pedals from the front door to the kitchen and back with Mummy holding him up! Today was Jeremy's last dose of anti-rejection drugs. He is quite pleased about that, because apparently the soft-gel capsules have a foul-tasting coating - but he much preferred to swallow the capsules rather than have it as an oral liquid (which also tastes disgusting, according to the doctors and nurses). If he had chosen the oral liquid, it would have had to be via his mouth because it could not be put down his nasogastric tube (unlike all his other oral liquid medications which can go in his tube). So now he is just on anti-fungals, anti-virals and Bactrim (used as a preventive mediciation for pneumonia). This morning we went out early (8am!) to the Big Swing Park - it was relatively deserted and the equipment was not wet with dew! Stephanie and Jeremy were delighted to play on the big swings, laugh themselves silly on the twirly spinners and play chasings around the stone statues. Jeremy went to hospital clinic today. Praise God that the doctor is happy with Jeremy's progress, and has started reducing his prophylatic or preventive medications. His blood counts have been OK, and he hasn't needed a transfusion for almost a month now. We feel so blessed that Jeremy's recovery seems to be going well. Jeremy didn't each much today - a piece of nectarine for breakfast and a few strips of seaweed for lunch - except for dinnertime, when he ordered and ate a fresh batch of homemade chicken sushi. Today was Ken's first day back at work for a long time. We are very thankful that his work has been so compassionate and generous in allowing him to take so much leave so that he could look after Jeremy (and Stephanie) before and after his transplant! Jeremy had a busy morning playing computer, marble race, playdoh cooking, chasings, and baking ham swirls and cinnamon swirls to eat for lunch - unfortunately, he only nibbled away at his food at lunchtime. However, he was agreeable to drinking water today (instead of having it down his nasogastric tube) as he wanted to run around the house yelling "Chase me! Can't catch me!". He was more enthusiastic about eating homemade sushi for dinner (nori, rice and cooked chicken), and afterwards he wanted to stay up and wait for BaBa to come home so he could eat some bites of BaBa's dinner too! The weather today was so much cooler than the weekend - and although Jeremy still felt a bit warm, his temps were marginally cooler than yesterday (and most importantly, it was under 38 degrees!). The little man skipped his morning nap, and had a longer nap in the afternoon (almost through to dinner time). This had us worrying a bit (and popping in to do frequent checks on him). After his nap, he seemed a lot better and was keen to play Mario Kart. Today's event was a blocked nasogastric tube! Tonight, as we went to attach Jeremy's feeds to his ng tube, the machine started beeping. Normally, it is just a simple case of ensuring the lines of the feed bag are not kinked, and resetting the alarm. However, as it kept beeping, we looked closer and realised that it was his nasogastric tube that was blocked! We tried pushing down some water, then attempted to draw some up, but it was quite stubborn, and nothing seemed to work. After 15mins of no progress, we ended up calling the nurses at Camperdown ward and asking for advice. We were worried that we would have to go in to Emergency and get the tube replaced (Jeremy is still not eating or drinking anywhere near the required amount). They suggested using some coca cola to see if it would help clear the line. After another 5-10mins, it finally gave in, and the line started working again (it could have been the coke mixing into the fluid in his ng tube and helping to dissolve the blockage!). Thankfully, this morning's visit to hospital was uneventful in contrast. The doctors are happy with his progress (they do not expect his appetite to return to anywhere near normal for quite a few months). Jeremy's appetite is always better when he is at home (surprise, surprise! ), and today he gobbled up some nectarine, cucumber and soy icecream! However, he needs to eat much more before we can stop his nasogastric feeds - and he also needs to drink much, much more (at the moment, we can put the water that he is not drinking down his nasogastric tube). Jeremy likes to end the day with a calming backrub from BaBa! As Jeremy has been afebrile for 48 hours and as his course of antibiotics finished today, the doctors told us to go home! Jeremy was glad to be out of hospital, and started ordering what food we are to cook for him and when we are to cook it! He helped to season baked chicken wings for dinner, and made a good effort trying to eat not only the chicken skin but also the chicken meat! 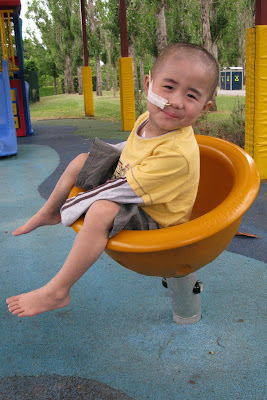 Here are some photos of Jeremy taken on Monday at the hospital playground while we were waiting for his room in Camperdown! It was a relatively quiet day in hospital for Jeremy. He had a nap in the morning and played with toys. He was happy to eat jelly at lunch, but didn't really have much appetite for much else - he even lost interest after a couple of hot chips. The doctors have told us the MRD results of last week's Bone Marrow Aspirate (day 60), and it has come back negative. This means that the MRD machine was unable to detect any leukaemia cells. This is the great news that we all have been praying for. He will have more Bone Marrow Aspirates on a regular basis to check that the leukaemia does not come back, but at the moment he is in remission. Thank you to all who have been praying for Jeremy for this miracle. Has healed our dear son! There's no more leukaemia in Jeremy! Jeremy was discharged before lunchtime today, as he had been doing well, and was now on his new antibiotic. We would have to bring him back each day, around midday to have this med in his central line. We came home to have lunch and dinner together, which was great. However, after dinner, he started feeling warm to the touch again, and we had to take his temperature. This showed he has a fever, and a quick call to the hospital confirmed that he had to come back in again. The children had both been asleep for some time, so we were thankful that KonKon was able to come and drive Jeremy back to hospital. Jeremy was stuck in Emergency for quite a few hours - it wasn't until around 2am that they got a bed in Variety ward. A different room this time, but it is good that they could then get to sleep for a few hours. Last night, Jeremy was placed on vancomycin (in addition to the 2 first line drugs). The blood culture test had come back positive for a 'gram positive' bug, but today they managed to narrow further to a 'gram positive cocci bug'. Anyway, we are now going to move exclusively to a drug starting with the letter 'T', and this will eventually be given as a daily dose. However, since Jeremy is just beginning on this drug, it has to be introduced slowly and given every 12 hours. The new 'T' drug was given at 2.30pm, but his temperature still managed to peak at 39.2 degrees at 3pm. The good news is that they have identified the bug, and have a specific drug for it. Also, since the plan is to give him this drug daily (aiming for 12pm noon), the plan is for him to be afebrile for 24hours so he can be discharged. Then we would just bring him in each day for his daily drug dose until the infection is gone. In other news, Stephanie got her first filling at the dentist. It was an event with much screaming/wailing/howling, and a river of tears were shed, but the cavity was filled. The cause of complaint appeared to be the foul tasting anaesthetic that smelt like citrus air freshener (which was used as an alternative to a NEEDLE). The poor little thing was so distraught at the taste that she sat up in protest and howled for a few minutes! Thankfully this was after most of the drilling was done (the hole was so big you could drive an imaginary tonka truck down to the gums). Anyway, since princess needs to have soft foods for the next 24 hours, she got a large slurpee for the walk home, and soy ice cream after dinner. Jeremy's temperature peaked overnight at 37.9 degrees, so he was allowed out on a gate pass today. Dad had a cracker of a headache, and Mum was totally worn out, but we were both extremely glad to have him home for a few hours. As we were required back at hospital by 5:30pm, we planned to have a larger than usual afternoon tea instead of dinner. For poor little Stephanie, this meant that when she walked in the door after school, we whisked her off to be washed and cleaned. We had a nice visit from Aunty J and we sat down together for "high tea", after which we had to quickly get ready to jump in the car to race back to Westmead. It was good to hear S & J chatting happily during the drive out there (they do fight after being apart - it must be adjusting to sharing attention!). Although J was happy, and did not complain about being tired or sick, he still registered a 38.4 degree temperature when he got back to hospital. As they have not yet determined the cause of the fevers, he might be required to have an extended stay at hospital. If that is the case, we are hoping to be transferred back to Camperdown ward as soon as possible! As I write this update, Jeremy is back at Westmead Hospital. Jeremy has not had any steroids since Sunday morning, as he was nill-by-mouth for yesterday's operation, and they decided to stop it yesterday afternoon. Today, Jeremy still ate breakfast, but not with as much gusto as his previous meals. 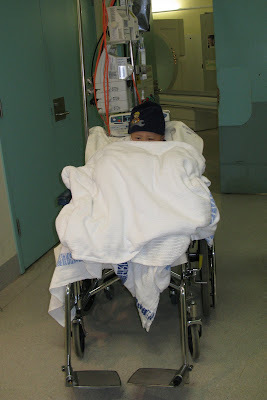 He was still happy and full of energy, but his hands felt a bit warm (but not fever like, and his head/neck was okay). Closer examination of his hands/feet show that a rash is appearing again (looks like the GVHD again). Of course, once we decided we were concerned, we then had to follow through and take his temperature - which turned out to be 38 degrees. What follows, is some agonising about the result. So we pray about it and decide to double check. This confirms a fever at 38.4 degrees. More agonising - We decide we have to call the hospital. Jeremy seems well and not tired/sluggish like he has been with some previous temperatures/infections. Despite that, and our suspicion that it was a fever from the re-appearance of his GVHD, and we reason that it was due to discontinuation of the steroids. The doctor tells us to come in, but to come to clinic and not emergency. By the time we packed our stuff and get out there, his temperature had dropped to 37.6. They decide he has to be admitted as he did spike a fever, and it's better to be cautious with someone in his condition. So the deal is as follows. If nothing is grown from the blood samples collected, (that means no infection is found) - then he can go home after 48 hours. If something is grown, then he is likely to be detained for at least a week after the first clean sample. Jeremy vomited twice this morning. Once was during his morning Wii session, after we had given him some meds via his nasogastric tube - the next time was just after our second attempt at putting in a salt-tablet infusion down his tube. However, this second time, we had spaced out the meds 20 minutes apart, so there was no need to redo all of the medicines a third time! Jeremy's appetite was much improved today. It started off reasonably well with some slightly overcooked bacon for breakfast (it was crunchy, which he seemed to enjoy). The added bonus here is that bacon is relatively salty, so hopefully it helps his sodium levels (which are on the low side, hence the need for 6 salt tablets a day). Jeremy also made a huge mess of the 'Goo-Paw' style noodles we offered up today, and he seemed to enjoy the pork we cooked with char siew sauce. He got stuck into watermelon and demanded some passionfruit gelato. After dinner, he even washed his tablets down with coca cola - a huge effort and a massive change from a few days ago. Jeremy had a pretty good day today. He did not need to go to hospital for a checkup, so he managed to relax and enjoy his 3rd full day at home. He still had 2 naps, but from our perspective, he managed to eat more than the previous day. At breakfast, he asked to eat some tuna on toast, and he ate about half a slice on his own. For lunch, he asked for chicken schnitzel, but we didn't have any chicken, so we gave him some hastily prepared pork with panko (japanese bread crumbs). Although he chewed through a few small slices, the food critic in him decided that he didn't like the crunchy bread crumb coating. Our dinners are getting earlier and earlier, and today was no exception. This time, Jeremy ate some carrot, red capsicum, and 3 spoons of rice. We are very happy to report that Jeremy has been a very good boy with his medicines. We leave the pills in a small dish, and tonight he picked them up and swallowed them without any prompting or complaints. For this we were very surprised and thankful, as some days, we have had to spend much time and effort to 'persuade' him to take his meds. 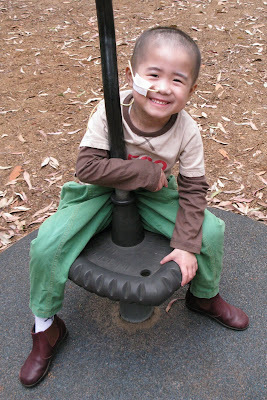 This Monday (16th), Jeremy will be going to Westmead for a bone marrow aspirate. He will be having these on a regular basis for some time going forwards. Please pray that it will show that he has healthy donor bone marrow, and is totally clear of leukaemia. Today's appointment was 8:30am at Westmead, which meant a very early start to the day for the whole family. Thankfully, Jeremy did not have to do much waiting, and the news was pretty good. The doctor was pleased with Jeremy's blood counts and electrolyte levels, to the point where he decided that we don't need to go back to hospital clinic this Friday. They even managed to get back by 11am. Next week, he said that we can drop down to 2 visits, and that future visits might only be once or twice a week (not Mondays, Wednesdays and Fridays as previously advised!). Thank God for this, as we are still exhausted from Jeremy's hospital stay! Jeremy's next visit to hospital clinic will be on Monday 16 November for his first post-transplant bone marrow aspirate. We are earnestly praying that the results of this bone marrow aspirate will be completely clear of leukaemia cells. This will be our constant prayer over the next few months and years (indeed for the rest of his life) - that the leukaemia will not come back (ie. relapse). Jeremy is still not eating or drinking much (although he is trying to do so), and gets tired very easily. He becomes frustrated when he is unable to wander around the house because we have hooked him up to his Kangaroo Pump for feeds or fluids. In order to provide enough sustenance to maintain his weight, his nasogastric feeds need to go in over 16 hours (mostly overnight), but when he wakes up in the morning he wants to be free! Tuesday was the first full stay at home day for Jeremy for nearly 3 months. He had quite a few naps, as well as helping Mummy bake a special surprise for Stephanie. They managed to quickly make and bake some cinnamon swirls in the time it took for Baba to walk to school, nag Stephanie to go back to her classroom to get some new home reading books, and carry her all the way home. Jeremy had a quick checkup at hospital clinic today - his first pilgrimage to Westmead as an outpatient in almost 3 months! His blood counts are good, but he needs to eat and drink much more. We were pleased that some local parks were deserted this afternoon, so he could have a fun time playing outside! T+54 AND JEREMY IS HOME!!! Hooray! Jeremy was finally discharged this morning after 84 days straight in hospital! He is very pleased to be back sleeping in his own bed after so long! And we are thrilled that he has reached another milestone in his long journey towards healing and recovery. No more night-time obs (temperature, blood pressure, oxygen saturation and pulse) every 4 hours (or every 2 hours if febrile)! No more 5am bloods! No more drips beeping and nurse call buttons going ding-dong! Jeremy has not had any fevers since Friday. The doctors told us that his recent fevers (and accompanying pin-prick rash all over his body) were caused by the GVHD (Graft Versus Host Disease) resurfacing because they had tapered the anti-rejection drugs too quickly. The doctors are pleased to see the GVHD (because of the Graft Versus Leukaemia effect) - they have recalculated his dose of anti-rejection drugs, and have put him on steroids to deal with the rash. We have set up a Kangaroo Pump in his bedroom so that we can run his nasogastric feeds overnight, and will need to set up a special area for all his medical paraphernalia! Jeremy will go back to hospital clinic 3 days a week for monitoring. Otherwise, he will be in isolation at home until his immune system matures (which could take up to 6 months or more) - no crowded places, no shops, no restaurants, no preschool, no church, and definitely no sick people! Jeremy had no fever today, and was excited to be allowed out on Gate Pass between antibiotics! At home he was happy to have some bites of couscous, nashi and papaya! Jeremy was afebrile overnight, but his temperatures went over 38 degrees this morning and came back down again this afternoon with Panadol. After a long morning nap, he did some painting and even wanted to eat a few bites of apple, pear and weetbix! 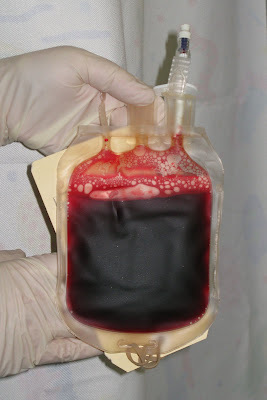 This afternoon Jeremy had a red blood cell transfusion. His recent blood results show that his platelet counts have recovered by themselves, and the last time that he needed a platelet transfusion was a week and a half ago! Usually, the platelets are the last to recover, but his new bone marrow seems to have decided to make platelets first instead of red blood cells! Jeremy spent most of the day napping, and then wanted to give his sharp teeth dinosaurs a bubble bath before dinner! Jeremy stayed at hospital today, because his blood electrolyte levels and nasogastric feeds have still not been sorted out. One of the problems is that there are only 3 dairy-free soy-based nasogastric feeds that he could use because of his allergies. This problem would be solved if he started eating properly again, but at the moment it is rare if he feels like eating and then he will only nibble at food (otherwise, nothing goes in his mouth!). His appetite has gone, thanks to all of the chemo and radiation that he had in the past and the medications that he is currently taking. Please pray that he will want to eat and that he will eat SOON! Jeremy had a fun time making playdoh with the play therapist - they made aqua blue playdoh, white playdoh with sparkly stars, and a terrific mess of flour all over his bed! Hooray! Jeremy was allowed home on Gate Pass, on condition that we put 4 x 150ml water down his nasogastric tube - we were 20ml short when we came back to hospital this evening! No diarrhea (actually no poo!) with his 50% Isosource 50% Neocate nasogastric feed mix, so he will continue with it tonight. Jeremy spent the day at hospital washing his dinosaurs and playing playstation, while the doctors and dietician continued to work on his blood electrolyte balance. He was glad to have a surprise visit from BaBa, and wanted to share a tuna and toast sandwich with him for lunch! Since switching back to Neocate for his nasogastric feeds, his poo problems have almost been resolved - tonight he is going to try 50% Neocate and 50% Isosource, and hopefully this has no adverse effect on his gut! We are thankful that his throat swab from Saturday came back clear, which means his cough is not caused by a bacterial or fungal infection. Although he is still coughing, it seems to be less each day. Jeremy was pleased to go home on another Gate Pass today, and wanted to cook and eat baked chicken wings. He made a delicious flour mix to coat the chicken wings using random shakes of whatever spices and herbs he found in the cupboard, but unfortunately only took a few bites of the cooked product. We are still encouraging him to drink more, and also working out how much water we are able to put down his nasogatric tube at home - this afternoon we overdid it, causing him to vomit the water back out! When he gets back to hospital at nights, the nurses take some blood from his central line and send it to the lab for testing. He also has blood taken in the early hours of the morning. Over the past few days, his electrolyte levels in his blood have not been normal and the doctors are adjusting and readjusting his overnight fluids (IV down his central line) to try to correct them. After an early morning platelet transfusion, Jeremy was subjected to a throat swab (as the doctors are concerned about his lingering dry cough). Said throat swab caused him to gag and vomit - over his bed and Mummy's jeans! However, after everything had been cleaned up, he was allowed to go home on Gate Pass. Since his overnight nasogastric feeds were changed from Neocate to Isosource (which has more calories per ml) on Thursday night, he has experienced bad diarrhea during the daytime. The doctors have switched him back to Neocate tonight, and hopefully this will resolve his poo problems! We are thankful for another Gate Pass today! We still have much work to do in relation to his fluid intake - however, in addition to what we can persuade him to drink, we are able to supplement that with water down his nasogastric tube. Jeremy's hair is slowly growing back - his head is no longer "shiny bald", but soft stubble! Today was the official Windows 7 release day - not that it made any difference whatsoever to the little man (we are still running Vista). Besides, if you were at hospital and you asked Jeremy "Where do you want to go today?" - he'd probably say "home". Anyway, Jeremy's counts were okay today, and he did not require blood products. He was allowed home today on the proviso that he drinks enough fluid (he has not been drinking much lately). He made a good effort, with the assistance of Sipahh straws. After a much-needed platelet transfusion and red blood cell transfusion, Jeremy was allowed out on Gate Pass this afternoon! His nasogastric feeds have been concentrated down from 20 hours to 12 hours, and we are trying to encourage Jeremy to eat and (more importantly) to drink more so he doesn't need fluids via the drip. Thank God for another Gate Pass today! The bone marrow transplant team are happy with Jeremy's progress, and have stopped his antibiotics because he was fever-free for most of yesterday. They have continued to change his medications to oral format where possible, such that tonight he was only connected up to his nasogastric feeds and no drip at all! We are thankful that Jeremy was able to come home on a Gate Pass today. He was pleased to be home and be able to get involved in preparing dinner (not that he ate much!). Jeremy's fever breached 39 degrees this morning. Thankfully, he responded well to panadol, and it dropped back down into the 37s later in the morning and he stayed fever free for the rest of the day. We had some good news today. The doctor came in and told us that the preliminary results of the skin biopsy indicate that Jeremy's rash is consistent with GVHD, and in this instance, they would label this as grade 1 GVHD, which they would not usually treat. They capped off Jeremy's lines today for a few hours, so he cheekily played hide and seek with Dr KonKon in his room. Stephanie came with Dr KonKon to visit and play, and they also fulfilled a very important objective of restocking the soy ice cream! Jeremy had a fever at 6:30am this morning. This meant no gate pass! A blood culture was taken, and they started on first line antibiotics. His temperature was up again (over 38 degrees) at 4pm, coming down with some panadol, but by 8pm had breached 38 degrees again. Although Jeremy was greatly disappointed, we are thankful that he was still energetic and managed to watch some TV, DVDs, as well as play on the playstation. We continue to be thankful that his white cell blood counts have improved each day (the growth is being boosted by the GCSF). We are still waiting for the platelets and haemoglobin counts to recover, as it takes longer for the bone marrow to recover/start producing them. He had a platelet transfusion today, and it is possible that he might require red blood cells tomorrow or Monday. The dermatologist came to do a skin biopsy this morning. Jeremy was a very brave boy, and had to lay very still while they carved out a skin sample from his foot. He was given some cream to numb the area, then some local anaesthetic as well as happy gas. He now has his foot bandaged, and the dressing will be changed daily by the nurses. We anticipate that the results won't be available until next week. After his biopsy, Dr KonKon and Stephanie arrived. They were able to play together with some lego zoo pieces and (of course!) dinosaurs! Jeremy has managed to start eating again, and today it seems his eyes were bigger than his stomach. He ate toast and tuna at lunch, probably too much, as he ended up regurgitating some of it. It seems that after his spew, his cough started getting worse. He still has the occasional sniffle. Thank you to everyone for praying for Jeremy daily. Please also continue to pray that his cough and nose clear up quickly, and that he does not have a respiratory/viral illness. The dermatologist came and examined Jeremy's rash, which is all over his body. However, he has ordered a skin biopsy for tomorrow before he makes a definite diagnosis. Apparently a skin biopsy will involve Emla cream, as well as an injection of local anaesthetic and some happy gas - please pray that Jeremy will be a brave little boy tomorrow! Jeremy had another platelet transfusion today - at the moment, he seems to be needing a top-up of platelets every second day. Today was Siblings Day - a special event run by the social work department for siblings of children with long-term illnesses. Stephanie, and about 20 other children her age, went on a tour of the hospital, played games together, and were entertained by the Clown Doctors and a puppet show. It was an exciting day for them to meet other siblings and learn about how the hospital works. Jeremy's cough and sniffle are slowly going away, but he has a rash which is spreading over his body and is very itchy. He is currently on antihistamines, and hopefully these will deal with the rash. He had a good time this afternoon with his family and GooPaw, playing some board games and having fights between the "leaf eaters" and the "sharp teeth" toy dinosaurs! Medium - Crayola Model Magic! Jeremy had a fitful sleep last night. It was the first night that he has not had any morphine infusing as baseline pain relief. Hopefully, he will be able to sleep better tonight, without requiring any shots of morphine. This has been a gradual process of downgrading his morphine levels/weaning him off the drug. Tonight, when they change the lines, they will be taking down the TPN as well. They have been steadily increasing his nasogastric feeds since reinsertion, and it should be back at full volume tonight, so this will allow him to get off the intravenous feeds (TPN). If he manages to stay off the TPN, then the triple pump will be replaced with a single pump (his IV stand is then going to get smaller!). Less machines and less cumbersome to move around. The BMT team came by this morning, and were happy with his progress, but are still concerned about his cough and runny nose. Jeremy no longer coughs when he is asleep, but does have a bit of a cough when he wakes up. Likewise, he tends to do a lot more sniffling as soon as he wakes up. We have politely pointed out that the sniffles only appeared after the nasogastric tube was inserted, but the doctors were unwilling to rule out a viral infection, even after their tests were done. Please continue to pray that his cough and runny nose go away quickly, and that he does not have a respiratory/viral illness. Jeremy's white cell counts have been slowly improving each day, but there is still a long way to go. 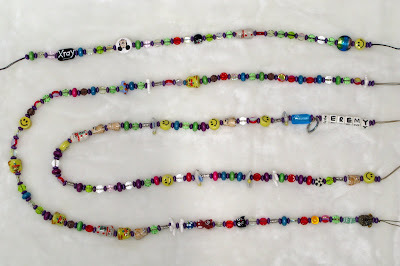 These are Jeremy's bravery beads (click on the picture to see it larger). Thanks to Cure Our Kids, Jeremy collects a bead each time he has a procedure. For example, the red beads are for blood transfusions, the various cat beads are for tests and scans (eg. X-rays, fungograms), and the big pretty bead on the top right is for his bone marrow transplant - click here for more information. He is up to his third strand, and he is keen to thread on his beads all by himself! Thank God that the doctors are happy with Jeremy's progress. We had our weekly meeting with the bone marrow transplant team today, and they are pleased that his new bone marrow has started to engraft. However, they were a bit concerned that his persistent cough and a recent sniffle may be symptoms of a respiratory illness. If his "runny nose" has not been caused by the reinsertion of the nasogastric tube, but is actually a respiratory symptom, he will be moved out of Camperdown Ward to Variety Ward. Variety Ward is where the oncology patients with infectious illnesses go, because it has special isolation rooms with air conditioning that vents straight outside. We were very upset when they told us that we were going to move today (even though he had not yet tested positive to a respiratory illness), but fortunately there was not a spare isolation room in Variety Ward! He also spiked a fever this afternoon, and was feeling quite out of sorts. Please pray that he does not have a respiratory illness and that his cough and nose clear up ASAP! And please pray that God's mighty healing hand will continue to protect and look after Jeremy. Thank you. Forgot to mention that over the long weekend, they decided to start reducing Jeremy's background morphine levels. As he has been on morphine for about 3 weeks, they are reducing the levels gradually. Sometimes he needs a few "boosts", especially when they did their thing with the nasogastric tube. His mouth still has some sores, but the doctor told us they have been there for a little while and are getting better. After the tube was back in yesterday, the feeds have restarted, and hopefully this kick starts his stomach and gets him eating again. His cough is still keeping him (and us!) awake at nights. Today, he was happy to get out of bed and play at a little table and chair in his room, where he put generous amounts of paint on a plaster dinosaur and 2 dinosaur pictures. He then had a good time with the play therapist - colourful painting with marbles, and making shapes out of special clay. And he also wanted to practice his playstation car rallying skills! Today is 3 weeks post transplant! We have Great News today! Jeremy's blood counts are showing white blood cells, and they have detected some neutrophils in his count as well (these are white cells that help fight infections!). We are so thankful and happy to see these first signs of bone marrow engraftment and recovery. We are still praying that the engraftment is successful and that there are no more complications. Otherwise, Jeremy did not have the happiest of days. The doctors decided that the nasogastric tube had to go back in, so after his platelet transfusion this morning, three nurses came in to help get the deed done. But he was so very brave about it, and did not make too much protest as it was being inserted. Imagine how you would like a tube being threaded up one nostril, down the back of your mouth, down your throat and into your stomach!! Since he had not had much to eat or drink, they were unable to test whether the tube was in the right place, so the portable xray machine was brought in. The placement was fine, so they should be restarting his feeds tonight. Jeremy was in a better mood today. He sat up and played some animal dominos, as well as some playstation (Rugrats and Colin Mcrae2). He had a good nap in the afternoon. He is still a good boy taking his medicines, and even managed to eat some apple this morning (as well as last night). Overnight he had a fever of 38.2 degrees, but thankfully his temperature dropped back down to normal range on its own. He still has a nasty cough, but his engraftment rashes on his arms and legs are gradually fading away (his cheeks are still quite rosy from the rash). Jeremy's cough is getting worse, and it started affecting his sleep last night. He started developing this cough after transplant, and it started getting worse over the past few days (since the tube came out). The doctors have already done chest x-rays and fungo-grams, which show his chect is clear, but the coughing is distressing for him (and tires him out). The explanation we are being given is that this coughing is due to the mucositis causing irritation in his throat. Jeremy had a platelet transfusion today, and the pre-medication contributed to him having another sleepy day. He has been a good boy and taken his medicines (coca cola assisted) and for the time being, they will hold off reinserting the nasogastric tube. Yesterday after suffering the trauma of vomiting up his nasogastric tube and having it hang out of his mouth, gagging on it, and just trying to pull at it, Jeremy decided to sleep. He slept most of the afternoon and evening, leaving me worried that he might have a disrupted sleep overnight. Thankfully, he had a good nights sleep, and our night nurse was very careful and minimised the number of times I was woken. Today, Jeremy was happy to see his mummy, sister and grandfather. There was a short period of respite until had another trauma around lunchtime. One of his central line attachments came loose. There was a bit of blood leakage, and a period of discomfort as all of his lines were changed. Apparently, these 3-way "tap" connectors are prone to coming loose. Blood cultures were taken immediately, just as a precaution. Jeremy had another platelet transfusion this morning. 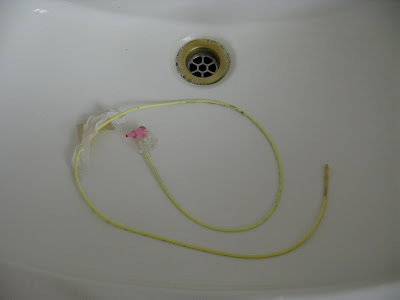 Unfortunately after that, Jeremy had a big spew and vomited out his nasogastric tube. He was most distressed with the tube hanging out his mouth, but has calmed down now and at least his face might not be so itchy from the tape. The doctors have not yet decided when to put the tube back down, and it will depend on how sore his mouth and throat are. Here are some recent photos - the wonderful life-giving cord blood, Jeremy on his way back from his CT scan (fungogram), and his crazy drip poles! Today is 2 weeks post transplant! Jeremy's high fevers continued throughout today, but thankfully his blood pressure remained stable. He still managed to sit up and play a game of Agitation (also known as Trouble) with the play therapist, and also to experiment with the electronic drum pad that the music therapist brought to his room! As nothing has been grown from his blood cultures (thus indicating no bacterial infection), he had a CT scan (or fungogram) this afternoon to see if a fungal infection is causing his high fevers. However, the doctors are hoping that his high fevers mean that his new bone marrow is starting to engraft - and we are praying that this is the case! The proof will be if his blood counts over the next few days start to show the existence of some white blood cells. Jeremy vomited twice last night, and combined with all the rumblings in his stomach, prompted the nurses to discontinue his nasogastric feeds. He was placed on TPN, so all his nutritional requirements are delivered via IV. He does have a very large number of lines connected to him now, and I have been constantly asked to adjust his singlet and move his lines to make it more comfortable for him. Jeremy appeared a lot better, and when I started up the laptop, he demanded to play some games. He played a while before asking me to help him, so we ended up playing 2 games together, then he decided he wanted to watch some of the Land Before Time videos. He watched 2 of these before falling asleep. During this time, his temperature dropped below 38 degrees! After Mummy and Stephanie arrived, he brightened up and summoned enough energy to play a monkey game that the play therapist had left him. He also managed to wrestle with his sister, before deciding that he wanted his bed clear of other people! As his stomach did not seem to be very happy, they switched him over to an intravenous version of panadol, and this managed to keep his temperature down. Sunday night, he had a bit of a nosebleed around midnight. Thankfully, they had some platelets that matched and were available for Jeremy to use. His nosebleed was not a big one, but he did spew up some blood later. We are also very thankful that despite having high fevers (41 degrees), his blood pressure was stable and he did not require any fluid bolus overnight. As Jeremy is really suffering from the treatment, he has been having a lot of attention overnight (obs for the last 2 nights have been hourly, sometimes even half-hourly). Jeremy has been having pretty high fevers >40 degrees more frequently than before - the concern is for the time just after the fever has peaked - there may be dilation of the blood vessels (leading to a drop in blood pressure). When this is combined with sleeping (which naturally drops your bp), Jeremy's bp drops to the level where the nurse is concerned, and calls for a doctor to check on him. For the past 2 nights, they have given him a fluid bolus (basically ~200ml of saline delivered intravenously). This increased the volume of fluid inside the blood stream, and has managed to bring up his blood pressure. Thankfully, Jeremy's body responded appropriately each time, and no escalation was required. Friday night was a really tough night for Jeremy. He had slept most of Friday because he was having high fevers >40 degrees. During the evening and overnight, his blood pressure dropped. He was given 2 fluid boluses (bolii?). A fluid bolus is basically saline given intravenously. They attempted to increase his blood pressure by putting more fluid into his system. The first one worked for about an hour or so, by the time they gave the second one, they were warning me that there was a remote possibility that we could have ended up in ICU (Intensive Care Unit). The nurses performed observations on Jeremy once an hour throughout the whole night. This was checking things such as temperature, blood pressure, pulse, checking his colour, feeling his feet to see if they were cold and checking the circulation there. As Jeremy had a fever for most of the night, he was also quite cranky, and demanded that I put the thermometer in, or that I put the bp cuff on. There was much prayer and anguish. Thankfully, we were not required to move up to ICU. Saturday was a better day for Jeremy. Yesterday he had slept through the chance to play with the play therapist. Today, he got a surprise visit from Mummy and Stephanie. He really brightened up with their visit. It was really good timing as they were also able to assist moving rooms. We have made it into one of the specific transplant rooms in Camperdown Ward. This is in a quieter wing, and is closer to the nurses area, so they should be able to keep a better eye on Jeremy overnight (which we earnestly hope and pray is not required!!). Well, the post-transplant honeymoon period is now over! Jeremy has been spiking fevers around 40 degrees every 5-6 hours. Thankfully, his fevers respond to Panadol and when his temperatures come down then he is happy to get up and play! The doctors are not concerned, and say that his fevers are all part of the transplant process - his little body has been hit so very hard with chemo and TBI, and he does not have any white blood cells to fight bacterial/fungal/viral infections. Please pray that these fevers will pass very quickly, and that his new bone marrow will soon engraft and start producing good blood cells. Today will also be his 18th red blood cell transfusion and his 16th platelet transfusion! For those wishing to help him and other oncology children (and who are able to do so! ), please give blood at your local Red Cross! Jeremy had a couple of fevers overnight, around 11am this morning it peaked at 40.1 degrees. This was the first time he has had a fever over 40 degrees during this admission. The nurse said that it wouldn't be a real transplant without having had a few fevers over 40 degrees. In our weekly meeting with the team today, they were pleased with his progress and were quite surprised to hear that Jeremy had attempted to eat some bacon this morning (He did have a big spew session around 10:30am, where he seemed to empty out everything in his stomach). However, he brightened up a lot this afternoon and happily played with the play therapist, creating new window decorations from litmus paper and paints. These will get laminated and then put on display on his windows. The room is steadily filling up with the results of his artistic activities. During playtime today, he got the play therapist to help him paint a glittery dinosaur, and then had her read a book to him. She brought over a little wheelchair for his Baby and he happily pushed it around the room. Jeremy was quite pleased, as he explained that Baby needs a wheelchair because Baby has no legs! Wanna see what Baby looks like? Well, Jeremy's baby looks like this one, but it has a central line taped to the chest, as well as a nasogastric tube stuck to its nose. Use your imagination and click here. Today is one week post transplant! We are so thankful that Jeremy has been coping well with the treatment so far. Although he has mucositis, he is still managing to keep up with his nasogastric feeding. He has had the occasional stomach pain, but thankfully this has been managed with extra morphine. The doctors are pleased with the progress so far, but have warned us that it is still possible that he will get worse before he gets better. However, they did look in his mouth, and his tongue looks better than it did a few days ago. The play therapist came by in the morning, but Jeremy was having a nap. Fortunately, he was awake when she dropped by later that morning. 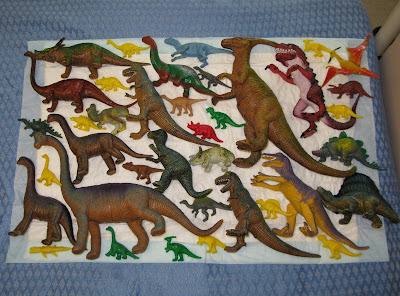 The play therapist came in the morning, and Jeremy got to play with some new cardboard cutout dinosaurs. He also got to play with water - washing the plastic dinosaurs and splashing in general. He had a bit of a nap for most of the afternoon, and therefore missed out on his weekly visit from the music therapist. T+4. Jeremy's temperature fluctuated last night, and hit 38 degrees this morning. This means they took blood cultures to determine if there is any infection. He had platelets today as his platelet count was low. Last night was a restless night for Eleanor as Jeremy seemed to be in some discomfort. Jeremy complained of pain in his tummy in the morning, so they stopped the feeds and hooked up the morphine. They restarted the feeds later and he did not complain or suffer further discomfort. Jeremy ended up sleeping/resting for most of the day. The play therapist came by today, and Jeremy had a good time playing. Towards the end of the session, he started getting a bit grumpy, and this may be due to discomfort, so some oxycodeine was ordered. Jeremy did some more sleeping in the afternoon, and pretty much slept through dinnertime (not that he really eats much now). Thankfully, he has still been tolerating the feeds through his nasogastric tube. His temperature today edged a bit higher 37.5 vs 37 yesterday, however, it dropped back to 37 this evening. Jeremy's had a short play in the morning, and then slept for a bit around lunchtime. The doctors came by to examine him, and noticed that the mucositis is starting to appear more obvious. There are times when he shows some discomfort when swallowing. The pain doctor has been around, and they have written up some higher strength pain killers (morphine will be available on IV if required), however, he seems to be coping with the oxycodeine for now. Let's hope he doesn't need the painkillers as this will almost certainly cause blockage and they are loathe to supply laxatives in his current condition. I had started my pilgrimage to Westmead a little later than planned, and unfortunately, this meant I ended up waiting 10-15mins inside the carpark waiting for a car space. I had missed out on the last available carspace by 1 car length! The white van got it - it was on the rooftop, so I wasn't massively disappointed. When I arrived in the room, Jeremy was sleeping. The play therapist had come and gone (it was better for him to sleep than play). We were still a bit bewildered with everything, and in the afternoon, we managed to speak to 2 members of the BMT team. This was reassuring, as we managed to ask some questions and get a feeling of what to expect. We were also advised that the whole BMT team has a weekly meeting with the family, and the meeting includes representation from nursing and one of the dieticians. He didn't eat all that much today, but he did manage to eat some marshmallows and some frozen blueberries. Other than that, we have been told not to worry as the nasogastric feeds are sufficient for his requirements - anything extra is a bonus! We have been told to expect that the next 2-3 weeks will be the worst. Things are expected to get worse before they get better. In their view, Jeremy is doing well given the circumstances. We are hoping and praying that Jeremy will not have a severe case of mucositis - he is starting to show signs of this happening with very thick stringy saliva, and a bit of a hoarse voice at times. We also pray that he does not have any complications or infections, and that he stays the happy cheeky boy that he is. Today was transplant day (T-day). Stephanie and I came out to Westmead so we could all be together, as this is a big milestone day for Jeremy. There was a nice morning session with the play therapist. Both Stephanie and Jeremy played with some green slime/goop and small plastic toys that drowned in the special slime. After making a bit of a mess, the kids were given a special balloon each, and some play doh to entertain them for the rest of the day. They were given 3 colours - green, purple and lilac. Thus far, they have resisted mixing it into one big brown mess. The transplant itself did not occur until the afternoon - it was over pretty quickly, and relatively uneventful. There was some extra activity in the time leading up to the transplant - extra fluids and specific medication was administered. At 2.45pm, the small pack of blood (~100mls) started infusing into Jeremy via his central line, and 30 mins or so later, it was completed. Who would've thought that such a tiny amount of special umbilical cord blood could be used to save a life. The pre-meds made Jeremy a bit irritable and tired - he ended up napping/resting on his bed for most of the afternoon. After the transfusion, he wasn't feeling that crash hot, and coughed/spewed up some blood. Thankfully we had been warned of the potential side effects - of which this was one. The other thing we noticed was a chemical smell, that was similar to creamed corn, but had a slight chemical tinge. This smell will come out of Jeremy for a little while - it is from the preservatives that were used with the cord blood. One of the things that we had been expecting (and half dreading), was the move around the corner. Most of the transplant patients are kept in the first 4 rooms, which located in a separate corridor. Early this morning, the transplant team were still considering what to do/where to move us (I had been asking them the last few days in order to prepare for the move). Later this morning, we finally found out that they decided we were going to stay in the same room! For a number of reasons, they decided against a cascade of moves (the ward was pretty full), and so we had to vacate our room for a bit over an hour whilst the cleaners did a big clean-up. PawPaw even saw the cleaners changing the curtains in the room, and we noticed that some of the ceiling grot that I pointed out to the nurses had been finally cleaned. Ultimately, we are happy and relieved/thankful to be remaining in Camperdown ward. The room might be slightly noisier than in the other wing, but its not so far a walk to the amenities (parents room and facilities). 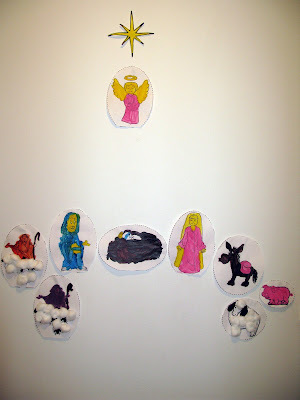 The play therapists are going to play a bigger role in his everyday activities. They will create a personalised sign for Jeremy to decorate his door. They will also create a bunch of posters to personalise the room for Jeremy. His current favourite cartoon is The Land Before Time (think of a bunch of young herbivorous dinosaurs running away from carnivores). Hooray! Another Gate Pass today! However, this will really be the last Gate Pass for a long time, as Jeremy will be hooked up to Cyclosporin tonight and tomorrow in readiness for his bone marrow transplant on Tuesday. Cyclosporin is an immunosuppressant or anti-rejection drug which will reduce the activity of Jeremy's immune system so that it will not reject the donor cord blood (the new bone marrow that he will receive on Tuesday). Cyclosporin will also be used after his bone marrow transplant to help reduce GVHD (Graft Versus Host Disease). GVHD is an immune reaction when cells of the donor's immune system recognise Jeremy's body as foreign and attack it. The skin, gut and liver are common targets of GVHD. Please pray that Jeremy will not experience severe GVHD complications, but that he will have a tiny bit of GVHD (which the doctors refer to as Graft Versus Leukaemia) so that his new immune system will wipe out any remaining leukaemia cells. Jeremy was given the chemo Etoposide this morning, then was allowed home on Gate Pass! Thanks to all who have been praying for Jeremy's TBI - he has now completed his 6 sessions of TBI without any general anaesthetic! He also scored another Gate Pass home tonight! Jeremy didn't need any general anaesthetic for his 2 TBI sessions today! He was also feeling well enough after his TBI to go home on Gate Pass for dinner tonight (and yesterday night too!). We had expected him to stay in hospital once TBI started, but the doctors and nurses are very keen for him to enjoy as much time out of hospital as possible and have been very accommodating! We are really thankful that he is feeling much better after these radiation sessions. On Wed night, he had spewed in the car on the way home, had watery/glassy eyes, and wasn't quite his usual self. Today (Thu), he had to have some blood products (immunoglobulin), which the nursing staff managed to get done between radiation sessions. 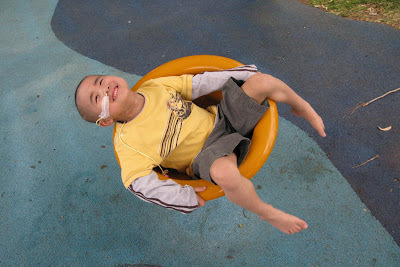 But when he is home, Jeremy is so happy and cheerful, he just brightens up and has an amazing amount of energy for play. Jeremy was such a good boy and lay so still during his TBI sessions today - he didn't need to have a general anaesthetic, and was just happy to watch The Land Before Time on a portable DVD player! He has two 30 minute sessions each day - at 8.30am and at 3.30pm. For each session, he has to lie in a special perspex bed, while radiation is beamed onto one side of his body for 15 minutes. Then his perspex bed is rotated 180 degrees, and radiation is beamed onto the other side of his body for 15 minutes. We are very thankful that Jeremy has been fever-free since last Tuesday and has been able to come home on so many Gate Passes. Today will most probably be his last Gate Pass for a long time, as he starts TBI tomorrow in preparation for his bone marrow transplant next Tuesday. He has quickly adjusted to his nasogastric tube, and wants to help when we attach his tube to the Kangaroo pump for his nasogastric feeds! He is so full of life and energy - watching him play at home, you wouldn't know that he is seriously ill.
Jeremy came home on a Gate Pass today, and will go back to hospital tonight for a red blood cell transfusion. The bone marrow transplant doctor has confirmed that TBI (Total Body Irradiation) will be twice a day on Wednesday, Thursday and Friday of this week, followed by the chemo Etoposide on Saturday. Jeremy's bone marrow transplant is now scheduled for Tuesday 15 September. Thank God that we could all spend Father's Day at home! We are thankful for another Gate Pass and another day at home together! Jeremy had a platelet transfusion this morning, then came home on a Gate Pass! Today Jeremy was granted an unexpected Gate Pass! As he has not had a fever since his rigors on Monday, and as he is otherwise active and "well", he was allowed to come home between antibiotics! Jeremy was most upset this morning when he woke from his "special medical sleep" with a nasogastric tube up his nose and down his throat! But by the afternoon, he seemed to be getting used to it and is tolerating his new nasogastric feeds. At the moment, the nasogastric feeds are just a supplement, and he is also eating using his mouth. The doctors have found that Jeremy's fevers are caused by an ESBL bug (a bug in his gut), and have changed his antibiotics accordingly. After his antibiotics were changed, he experienced higher fevers and about 15-20 minutes of rigors - apparently this meant that the bug was reacting to the new antibiotics and that the new antibiotics are working! He has also been moved from a shared room to a single room because of the bug, but is still in Camperdown Ward. The bone marrow transplant doctor decided today to postpone Jeremy's bone marrow transplant from 7 September to 14 September, to allow him a week to recover from his fevers. So instead of TBI and the chemo Etoposide this week, Jeremy will have TBI and Etoposide next week - for the rest of this week, he will be continue his course of antibiotics to fight the bug.